On Tuesday the Republican Senate Majority Leader, Mitch McConnell, was forced to make an embarrassing announcement. After insisting that the Senate would vote on the GOP’s ObamaCare repeal bill before the July fourth recess, he has now removed it from the schedule. He had a good reason. There was no way it pass. At least nine Republican senators had indicated that they would vote no. These are disastrous numbers for any public policy. It’s startling that the GOP would even be interested in pursuing this farce. And yet, McConnell continues to be optimistic about its prospects for passage. So does Donald Trump, who just met with the GOP senate caucus and celebrated their non-achievement. 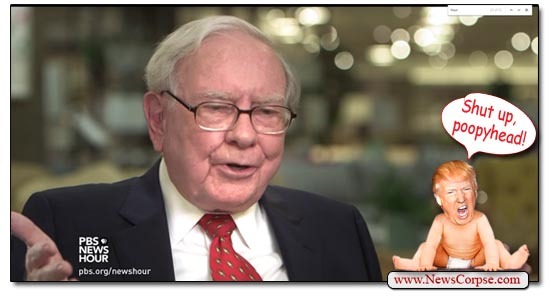 Buffett: “Well, I brought my tax return along for the last year. I filed this on April 15. And if the Republican — well, if the bill that passed the House with 217 votes had been in effect this year, I would have saved — I can give you the exact figure. I would have saved $679,999, or over 17 percent of my tax bill. “There’s nothing ambiguous about that. I will be given a 17 percent tax cut. And the people it’s directed at are couples with $250,000 or more of income. You could entitle this, you know, Relief for the Rich Act or something, because it — I have got friends where it would have saved them as much as — it gets into the $10-million-and-up figure. Indeed. The median net worth of members of Congress is slightly more a million dollars. Fifty-one percent are millionaires. Obviously, they would personally profit from the changes proposed in the Republican bill. And that profit comes at the expense of millions of Americans being thrown off of their insurance plans. Millions more would suffer higher premiums and deductibles, fewer services, and denial of coverage for preexisting conditions. Buffett has long been an advocate for average Americans, despite his great good fortune. His critical observation that he pays a lower tax rate than his secretary became known as the “Buffett Rule.” He’s a shining example of a Patriotic Millionaire (billionaire) who puts the welfare of his country and fellow citizens above his own personal interests. It’s the sort of compassion that Republicans ought to exercise when crafting their healthcare bill. But then, why would they start now? They have never done it before. My understanding is that there are over 300,000 VETERANS on Medicaid. Excellent point–Amoral, indeed. The sad thing is the GOP knows this, and not just with this bill but with most of their policies which always favor the well to do and shits on the working class. And all in the name of liburty and freeeeduuum. The tax cuts associated with this bill are for the rich and not the working class or even the middle class. I watched a sound bite of Orin Hatch last night who couldn’t say what was good about this bill but made sure to remind us if we did something good for citizens we would be falling into the abyss of socialized medicine. (Words to that effect) I’m still waiting for one of these assholes to tell me what’s wrong with that. As a lifelong govt employee, I appreciate my healthcare coverage and think everyone should have access to the same. Buffet is a billionaire’s billionaire. He knows single payer is the answer.